GREAT FALLS, Mont. — A Montana man was arrested after he apparently “liked” his most wanted poster on a Crimestoppers Facebook page. 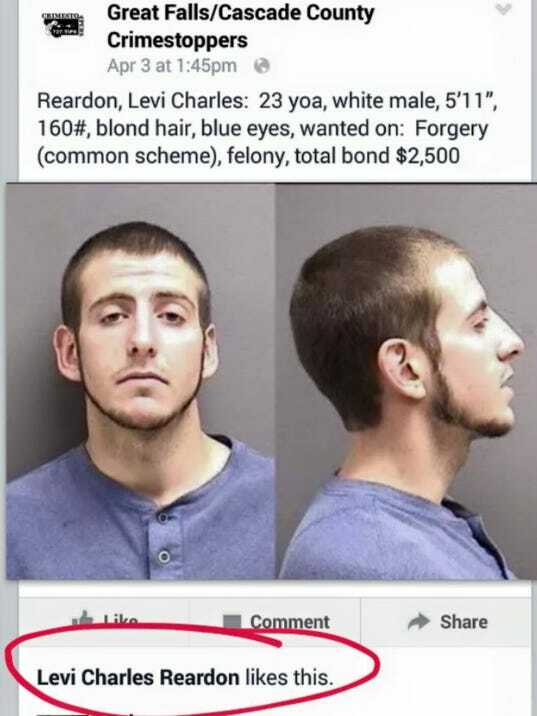 Levi Charles Reardon initially “liked” his photo on the Cascade County Crimestoppers Facebook page. Luckily, the Great Falls Tribune managed to capture a screenshot before Reardon revoked the like. He was arrested last week without incident. Reardon, 23, was featured as one of Cascade County’s most wanted suspects in April. He has been accused of felony forgery after he allegedly stole a wallet and cashed forged checks. He made his initial court appearance earlier this week.